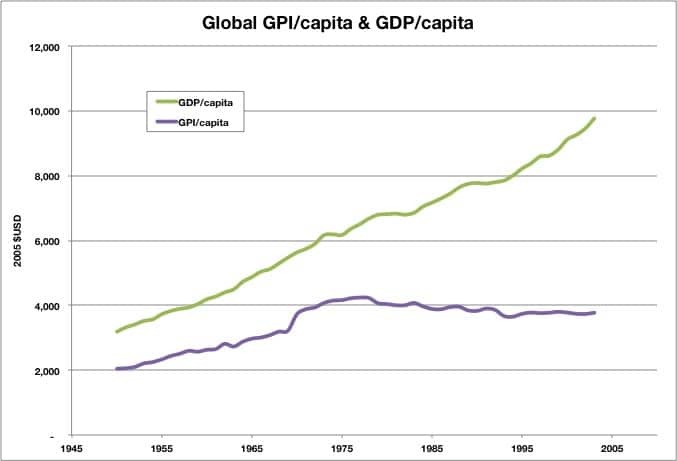 Economic growth means an increase in real output (real GDP). Therefore, with increased output and consumption we are likely to see costs imposed on the environment. The environmental impact of economic growth includes the increased consumption of non-renewable resources, higher levels of pollution and potential loss of environmental habitats. However, not all forms of economic growth cause damage to the environment. With rising real incomes, individuals have a greater ability to devote resources to protecting the environment and mitigate the harmful effects of pollution. Also, economic growth caused by improved technology can enable higher output with less pollution. 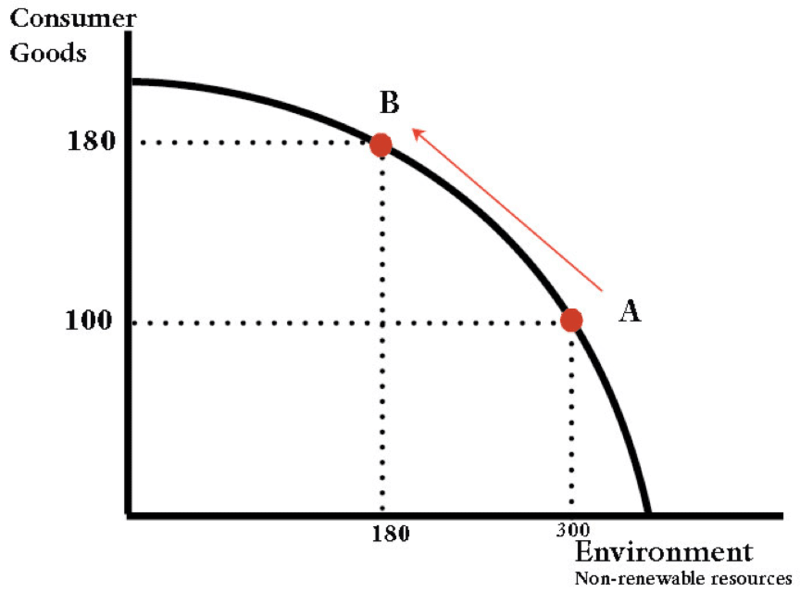 This PPF curve shows a trade-off between non-renewable resources and consumption. As we increase consumption, the opportunity cost implies a lower stock of non-renewable resources. Loss of species diversity – damage to natural resources has led to species extinction. Pollution. Increased consumption of fossil fuels can lead to immediate problems such as poor air quality, soot, (London smogs of the 1950s). However, some of the worst problems of burning fossil fuels have been mitigated by Clean Air Acts, limiting the burning of coal in city centres. Showing that economic growth can be consistent with reducing a certain type of pollution. Less visible more diffuse pollution. While smogs were a very clear and obvious danger, the effects of increased CO2 emissions are less immediately obvious and therefore there is less incentive for policymakers to tackle. Scientists state the accumulation of CO2 emissions have contributed to global warming and more volatile weather. All this suggests economic growth is increasing long-term environmental costs – not just for the present moment, but future generations. Damage to nature. Air/land/water pollution causes health problems and can damage the productivity of land and seas. Soil erosion. Deforestation resulting from economic development damages soil and makes areas more prone to draught. Loss of biodiversity. Economic growth leads to resource depletion and loss of biodiversity. This could harm future ‘carrying capacity of ecological systems’ for the economy. Though there is uncertainty about the extent of this cost as the benefit of lost genetic maps may never be known. Long-term toxins. Economic growth creates long-term waste and toxins, which may have unknown consequences. For example, economic growth has led to increased use of plastic, which when disposed of do not degrade. So there is an ever-increasing stock of plastic in the seas and environment – which is both unsightly but also damaging to wildlife. 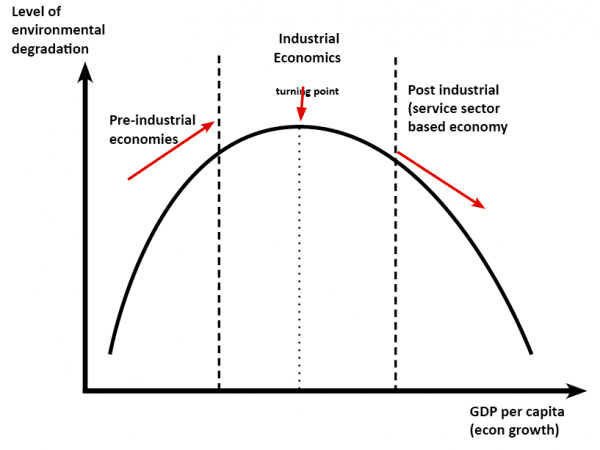 One theory of economic growth and the environment is that up to a certain point economic growth worsens the environment, but after that the move to a post-industrial economy – it leads to a better environment. 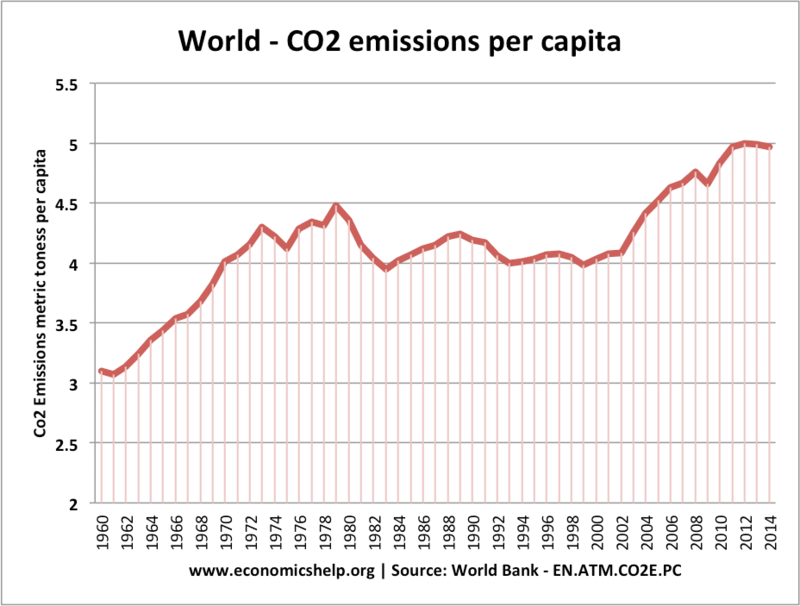 For example – since 1980, UK and the US have reduced CO2 emission. 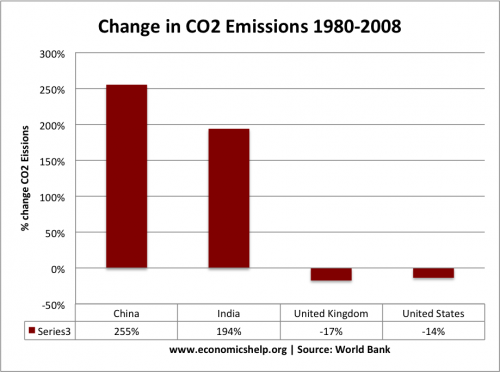 The global growth in emissions is coming from developing economies. The U-shaped maybe true of pollutants, but not the stock of natural resources; economic growth does not reverse the trend to consume and reduce the quantity of non-renewable resources. Reducing pollution in one country may lead to the outsourcing of pollution to another, e.g. we import coal from developing economies, exporting rubbish for recycling and disposal. Environmental policies tend to deal with pressing issues at hand but ignore future intergenerational problems. This suggests that economic growth will damage the environment, and damage will itself start to act as a break on growth and will force economies to deal with economic damage. In other words, the environment will force us to look after it. For example, if we run down natural resources, their price will rise and this will create an incentive to find alternatives. This is more pessimistic suggesting that economic growth leads to an ever-increasing range of toxic output and problems, some issues may get solved, but they are outweighed by newer and more pressing problems which are difficult if impossible to overturn. This model has no faith that the free-market will solve the problem because there is no ownership of air quality and many of the effects are piling up on future generations; these future effects cannot be dealt with by the current price mechanism. This suggests that in the early stages of economic growth, there is little concern about the environment and often countries undermind environmental standards to gain a competitive advantage – the incentive to free ride on others’ efforts. However, as the environment increasingly worsens, it will reluctantly force economies to reduce the worst effects of environmental damage. This will slow down environmental degradation but not reverse past trends. A shift from non-renewables to renewables A recent report suggests that renewable energy is becoming cheaper than more damaging forms of energy production such as burning coal and in 2018 – this has led to a 39% drop in new construction starts from 2017, and an 84% drop since 2015. Social cost pricing. If economic growth causes external costs, economists state it is sociall efficient to include the external cost in the price (e.g. carbon tax). If the tax equals the full external cost, it will lead to a sociall efficient outcome and create a strong incentive to promote growth that minimises external costs. Treat environment as public good. Environmental policy which protects the environment, through regulations, government ownership and limits on external costs can, in theory, enable economic growth to be based on protection of the environmental resource. Technological development. It is possible to replace cars running on petrol with cars running on electricity from renewable sources. This enables an increase in output, but also a reduction in the environmental impact. There are numerous possible technological developments which can enable greater efficiency, lower costs and less environmental damage.